Last Halloween, I became obsessed with this image. I spotted it randomly on Pintrest, and fell in love. There was something magical about it. I have no idea who created it, whether it is old or new, or where it originally came from. At the time all I knew was that I wanted to be this for Halloween. I tried hard to find some kind of vintage spaceman costume, but failed on all fronts. I’m not very crafty, so there was no way I was going to make one. In the end, I just created my own spin on the costume. 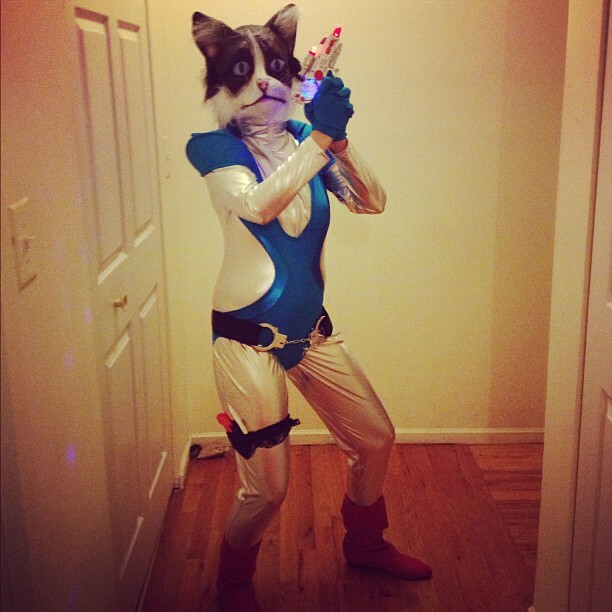 I combined 3 different costumes to create my ‘Space Cat’. I effectively scared most of NYC…or at least the people I saw on the subway since I refused to take off my mask. My version of Space Cat. Since that time, I’ve fallen in love with all things ‘space cat’. 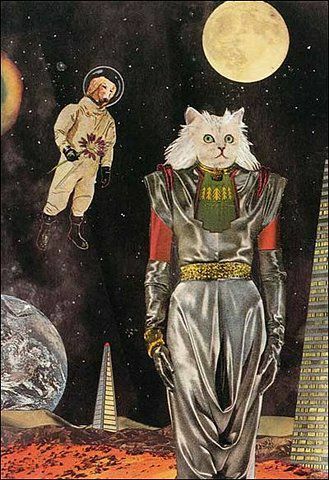 I love the combination of cats in space. I find it highly entertaining for some reason. 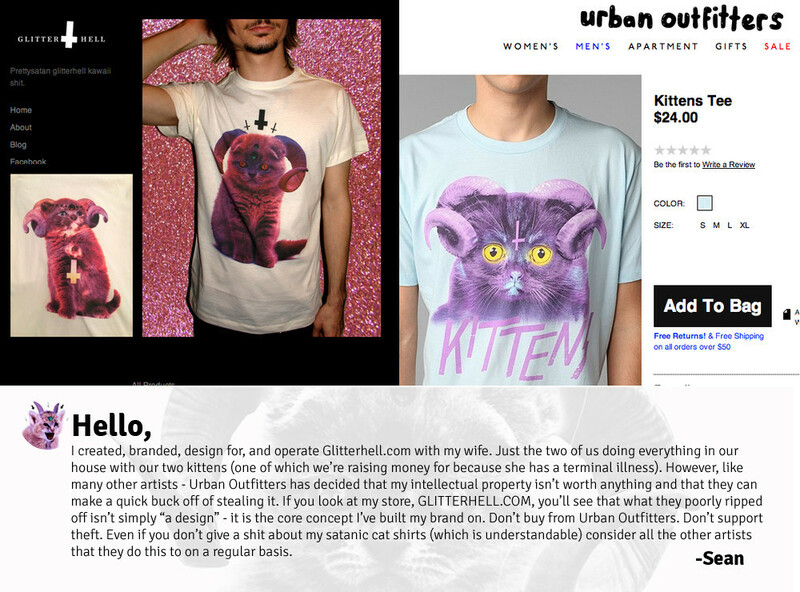 I decided to do an Etsy search for ‘space cat’. I found some pretty rad things. Click through to see some highlights. This is a head’s up for everyone. I was contacted the other day with some fabulous news. On Monday, February 18th, Network Awesome is paying tribute to CATS! For those who don’t know what Network Awesome is, it is an online TV ‘channel’. Every day they curate ‘shows’ pulled from YouTube. Their system stitches the various videos together and presents it linearly to the viewer. It’s pretty awesome. Monday’s schedule will include a hilarious collection of ‘When cats attack’, collections of music and art inspired by cats, as well as a mockumentary about their favorite controlled substance…catnip! The program will also include the Korean horror film ‘The Cat’ and Stephen King’s 1985 Cat’s Eye. I’m stoked. If I didn’t have to work tomorrow, I would 100% stay in bed and watch all of this on rotation….for hours. Banana Joe, a black affenpinscher, won Best in Show at the Westminster Kennel Club Dog Show on Tuesday. He’s cute, he’s got a funny face, he’s the first of his kind to win Westminster. Congrats Banana Joe, but yawn. Let’s talk CAT SHOWS! Cat shows don’t get nearly the amount of attention as dog shows. In the future, with the internet’s love of all things cat, I’m sure this will change, but for now they are still flying under the radar except to those who are truly devoted. This is where photographer Dustin Fenstermacher steps in. In 2009, after the loss of his father, Dustin needed to escape. His escape route? Cat shows. I’m not sure exactly how many cat shows Dustin has visited over the past couple of years, but he recently had a gallery exhibit at Gravy Studios showcasing the photographs from this period. Click through below to see more stunning photographs.